He cited data from the Employees’ Provident Fund Organisation and the Employees’ State Insurance Corporation to make his case. Assuming 50% overlap between EPFO data and ESIC data, he said 10 lakh jobs were being created every month, working out to 1.2 crore jobs a year. “It is not a survey of a few thousand people that is giving us these numbers. It is actual data,” the Prime Minster said. 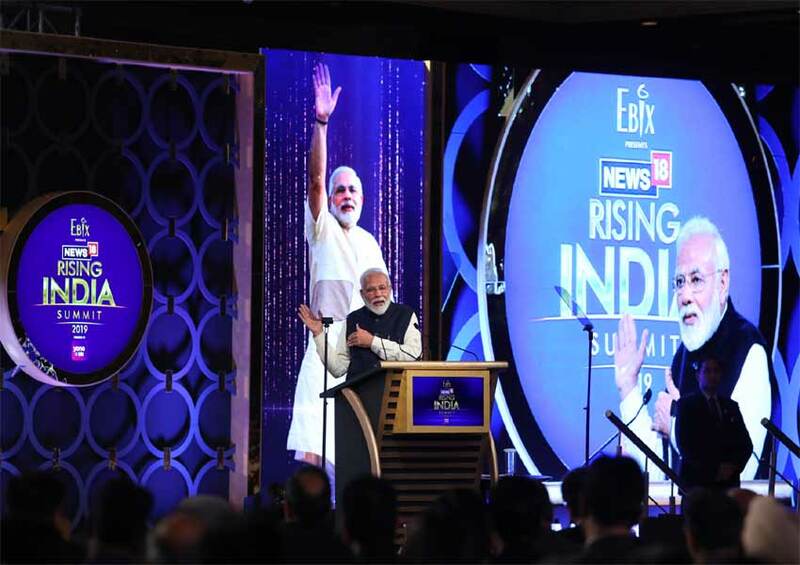 The honorable Prime Minister was speaking at the Rising India Summit, the most anticipated event in the world of news and current affairs in India. Rising India is the preeminent forum for the country’s biggest newsmakers and the best ideas. Mr. Modi came to power in 2014 with the biggest mandate in nearly three decades. A general election is set to be announced in the next few weeks as the Prime Minister bids for another term. Giving the keynote address, he cited growth in a number of sectors, such as tourism and infrastructure creation, and pointed to data on job-creation from states such as Karnataka and West Bengal to make the case that the National Democratic Alliance government had created employment opportunities at a brisk pace. “Is it possible that India has become the world’s fastest-growing economy without creating jobs? When Foreign Direct Investment is at an all-time high, is it possible there is no job creation? Are people coming out of poverty without job creation?” he questioned. The Prime Minister assailed the opposition, which he said had ruled the country for the best part of India’s independence but failed to deliver results. He pointed to projects in Uttar Pradesh and Bihar which had not been completed for decades. “I am here to change the Late Lateefi culture. Whatever happens, taxpayer money should not be wasted,” he said. The Prime Minister held up the key programmes of the government, among them, Jan Dhan to open bank accounts, the Aadhaar unique identity project and its linkage with mobile phones. Because of the JAM trinity, fake names had been weeded out and government benefits worth Rs 6 lakh crore had been transferred directly to citizens, saving Rs 1.1 lakh crore, he said. “The scope for leakage is zero. If someone wants to carry out a fodder scam, how will he do it? … Now I am proud to say that instead of 15 paise out of every rupee earlier, the full 100 paise is reaching people,” the Prime Minister said. Sadhguru Jaggi Vasudev and Baba Ramdev began proceedings at the Rising India Summit on Monday with a ‘The New Mantras for India’ moderated by poet-adman and CBFC chairman Prasoon Joshi. Corporate titans Ajay Singh, Suneeta Reddy and Robin Raina were joined by policy-makers Subhash Chandra Garg and Amitabh Kant to discuss ideas for a new growth impetus. Union ministers Ravi Shankar Prasad, Piyush Goyal and Suresh Prabhu promised to return with renewed vigour and Madhya Pradesh chief minister Kamal Nath asserted that his top priority is addressing farm distress. Audiences can look forward to watching a galaxy of stars in action on Tuesday. Among those will be BJP President Amit Shah, union ministers Arun Jaitley, Smriti Irani and Rajyavardhan Rathore, boxer Mary Kom, cricketer Anil Kumble, actors Kamal Haasan, Deepika Padukone and Taapsee Pannu, Supriya Sule of NCP, Chirag Paswan and Congress social media head Divya Spandana.